These represent just a few of the groundbreaking possibilities. The inferencing operations in an interactive application such as a game coexist alongside numerous other real-time tasks juggled by the game engine. These inferencing operations are often delicately intertwined in the various real-time engine loops, such as graphics rendering, physics simulation, user interaction, and much more. This makes integrating a large standalone inferencing engine such as TensorRT difficult to integrate into a game. Having two independent run-time engines that can only communicate in a coarse-grained way, unable to easily share assets and resources in the game, is difficult to manage for efficiency and performance. Enabling the developer to access inferencing acceleration from the same API that they are already using to control everything else flowing through the GPU seems like a much better solution for games. If that developer desires to access state-of-the-art GPU rendering and compute functionality in a way that doesn’t lock them to a single platform, then that API is Vulkan! NVIDIA has led the industry in developing and deploying inferencing acceleration on GPUs. Now we are turning our attention to enabling developers to access machine learning acceleration through the Vulkan cross-platform GPU API. We have developed a vendor extension to bake inferencing into Vulkan. NVIDIA is making proposals to the Vulkan working group at Khronos—the standards consortium which manages Vulkan—to help the industry cooperatively create a true multi-vendor solution to machine learning acceleration within the Vulkan open standard. So, what could Vulkan inferencing acceleration look like? If you analyze the basic mathematical operations needed for neural network inferencing, you’ll find that execution time is dominated by multiplying together large matrices, typically at a low numerical precision—16-bit floating point or less. However, the traditional mechanisms that Vulkan provides for spreading work over the GPU’s parallel processors focus on graphics pipeline operations and are not ideal for processing this new tensor data type. 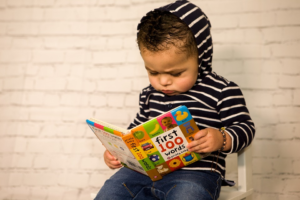 Programmers can and do use existing Vulkan functionality to accelerate large matrix multiplies, but typically end up with complex code that has to describe each individual math operation as well as how to efficiently feed those operations with data. This code often ends up being optimized for specific GPUs, making it hard to support and port efficiently to other GPUs. More importantly, such low-level code robs the GPU vendor of the opportunity to optimize tensor operations in their Vulkan driver or even use dedicated tensor acceleration hardware. This problem is easily solved by providing one new primitive operator—matrix multiplies. By making matrices an opaque data type, we can enable GPU vendors to optimize the matrix multiply operator in a way that best suits their hardware, while enabling the developer to write much simpler inferencing code that can be easily and efficiently ported across multiple platforms. This is consistent with Vulkan’s philosophy of providing the programmer with low level, explicit control of GPU resources. 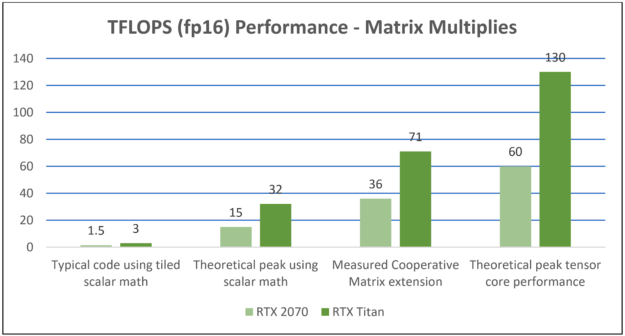 NVIDIA’s VK_NV_cooperative_matrix Vulkan vendor extension enables programmers to specify matrix operators of the form D = A*B+C in which the sizes of the matrices are MxNxK. (A = MxK, B = KxN, C&D=MxN); where M is the number of rows and N is the number of columns. Programmers select a precision of 16- or 32-bit floating point. We have found this to be a surprisingly clean and elegant programming model with good performance and usability for inferencing acceleration. The data on that compute unit is the local workgroup. Invocations running compute shaders can share data in the local workgroup via shared memory. Vulkan 1.1 introduced an important new feature called subgroups which enables a subset of invocations to share data in a set of powerful parallel operations at a significantly higher performance than shared memory. The new matrix type defined by the Cooperative Matrix Vulkan extension spreads the required matrix storage and computations across a set of invocations, typically a subgroup, and all the invocations in the subgroup cooperate efficiently to compute the result. Vulkan shaders can then use and combine these efficient cooperative matrix operations into larger inferencing solutions. Additionally, if the GPU includes dedicated hardware for high-speed matrix operations, such as the Tensor Cores on Turing GPUs, then the Cooperative Matrix extension can tap into the power of this acceleration with no application changes. // pairs of those matrices. NVIDIA has created a benchmark application in addition to the specifications and drivers. You can find the source in the Cooperative Matrix Github repo. Using the Vulkan extension revealed significant speedups versus code using traditional Vulkan scalar math operations by seamlessly and efficiently harnessing the power of Turing Tensor Cores, as shown in figure 1. If the Cooperative Matrix Vulkan extension is interesting to you, you can try it out right now! 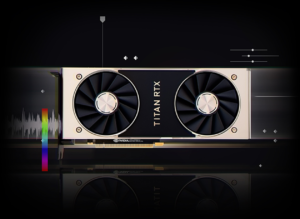 It is shipping for Turing-based GPUs in NVIDIA driver versions 419.09 (Windows) and 418.31.03 (Linux) available here:https://developer.nvidia.com/vulkan-driver. Links to all the relevant specifications are here: https://github.com/KhronosGroup/Vulkan-Docs/issues/923. Please provide your feedback to us if you try it out. We would love to hear about your experiences as we work with the industry, through Khronos, to bring cross-vendor inferencing solutions to the Vulkan standard. Please leave a comment below if you have questions or other feedback. Neil Trevett is Vice President Developer Ecosystems, NVIDIA. Neil works to enable application developers leverage GPU acceleration. Neil is also the elected President of the Khronos Group that manages and evolves open standards such as Vulkan, OpenXR, OpenGL ES, WebGL and glTF. Jeff Bolz is an NVIDIA Distinguished Engineer. Jeff is a leading contributor to Vulkan, where he designs API abstractions and shading language programming models for the latest hardware.